As previously mentioned I was having some St. Patrick's day thoughts earlier in the year. The key thing is that I definitely wanted to have heart shaped leaves. I was thinking to perhaps extend the structural part of the leaves directly into the centre of the compound knot, but ran out of time this year. Then, as a design consideration, I had recently read something where someone mentioned "luck of the Irish" or shamrocks or... and illustrated it with the photo of a lovely 4 leaf clover (alas, I've long since forgotten the source of this). Then someone Irish scathingly rebuked them for using a 4 leaf clover instead of the proper 3 leaf clover. So, even though I think the 4 leaf version is more successful as a design (at least this year! ), here's both. The 3 leaf stem is what I call the half-connection or a half 2 strand Matthew Walker or a simple snake sinnet (I think Suzen Millodot's snake knot includes some looping back to the previous knot, but my version doesn't and I've misplaced my copy of her first book (what else is new?)). 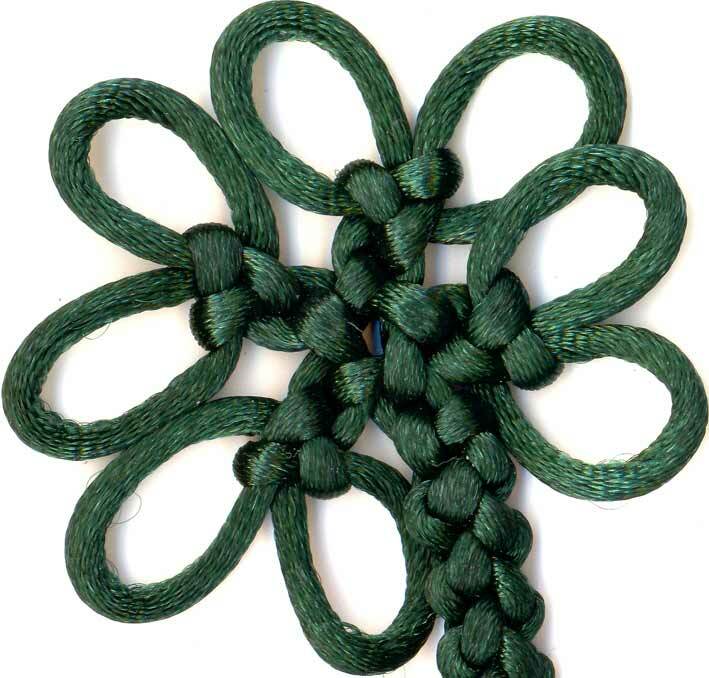 The 4 leaf stem is a phoenix tail sinnet, something very like a crochet chain but with 2 loops being worked at once instead of just one.